Make your own mosaic with shapes and colours! I've been wanting to let Angel make a paper collage for some time. You know, the simple kind where you draw for instance a big heart shape, then tear up small pieces of coloured paper and stick them one by one to form the shape. 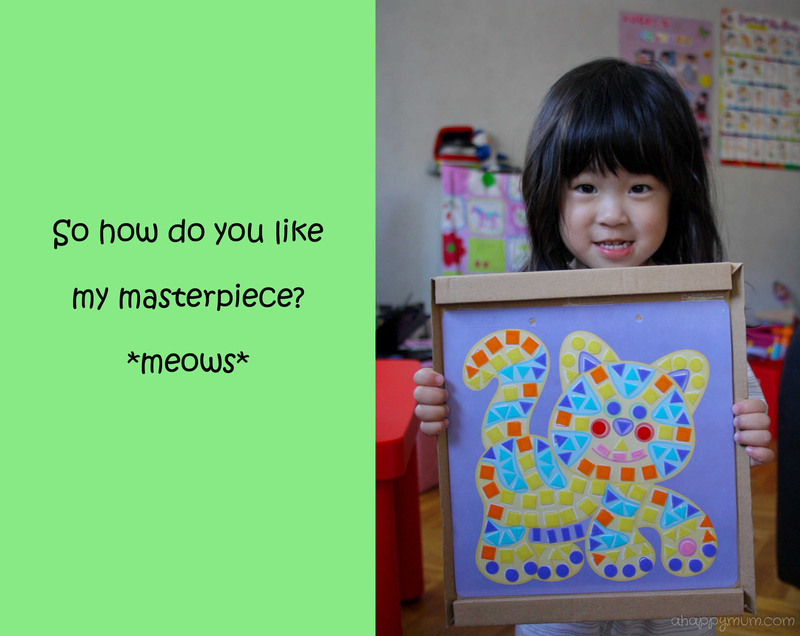 I don't remember most of the craft sessions I did as a child, but I do remember this one and how I love ripping up those pieces of paper. Then I came across this make-a-mosaic template set which was sold in the toy store and it dawned on me that mosaics can be a great way to teach Angel more than tearing up paper and applying glue. 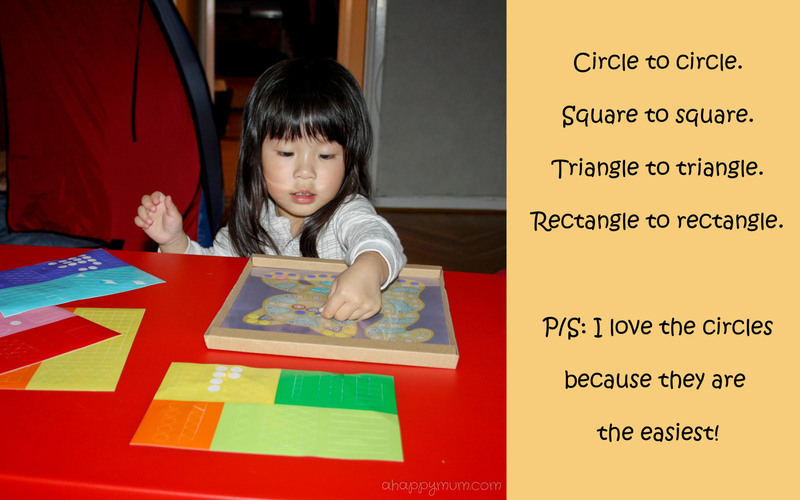 In fact, it can be a fun and educational way to learn her shapes and colours too! Firstly, choose your pattern sheet, place a piece of plastic sheet in front of it and hold them in place. You can use a clip board or just use sticky tape to secure them onto a piece of cardboard for easy handling. Explain to your child on what she is supposed to do. It's real simple and yes, even my 2-year-old understands that you are supposed to match the colours and shapes and then just stick them on! 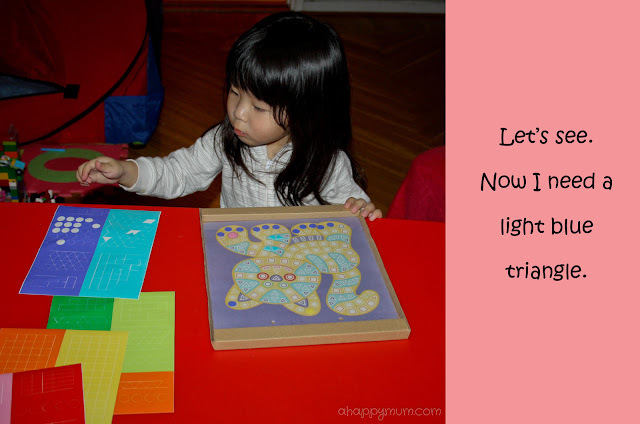 It's a terrific way to teach your child colours and shapes and giving her something hands-on to do helps to reinforce the knowledge. While it might be fun to mix up the colours and give the cat a colourful manicure, I would gently remind her if she got her colours mismatched and asked her to search for the right one instead. Peeling off the stickers is also a way to train up her patience. And mine too. I would be glad to help her out when she got overly frustrated but most of the time, she would manage to do it after a few tries and it's the kind of thing where the more you practise, the better you get. Not to mention the sense of satisfaction you see on her face when she succeeds. It might take up one hour just to get one mosaic done so we decided to split the session up before we started to see stars. 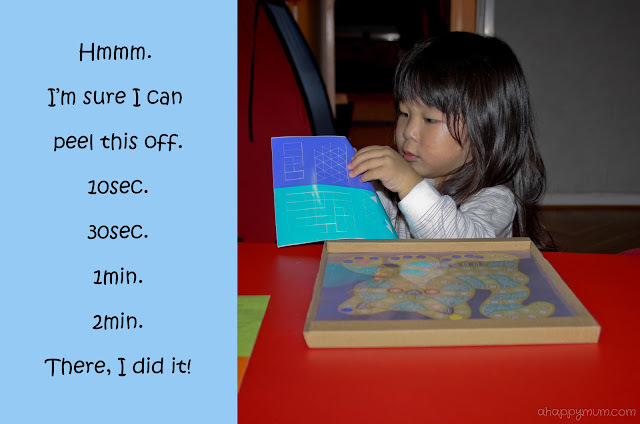 Moreover, you don't expect a young toddler to have that long an attention span, but if you keep the craft away and take it out the next day, chances are she can't wait to get her hands on it again. When completed, remove the plastic sheet, punch two holes, attach the string and you are done! We now have a colourful cat hanging on our wall along with Angel's art pieces. The idea behind this craft is great and even without the pattern sheets, for your next paper collage session, why not considering cutting up shapes from different coloured paper and let your child learn as she creates her own mosaic? P/S: That said, I'm still gonna let her try out the ripping paper one soon. Honestly, I find this a really fun craft activity for myself too! haha, this is such a great way to teach kids shapes and colours! Hehe yeah I can't help myself but to paste some too. Wahaha. Tempting. =) Yeah I think it's a simple and fun exercise!